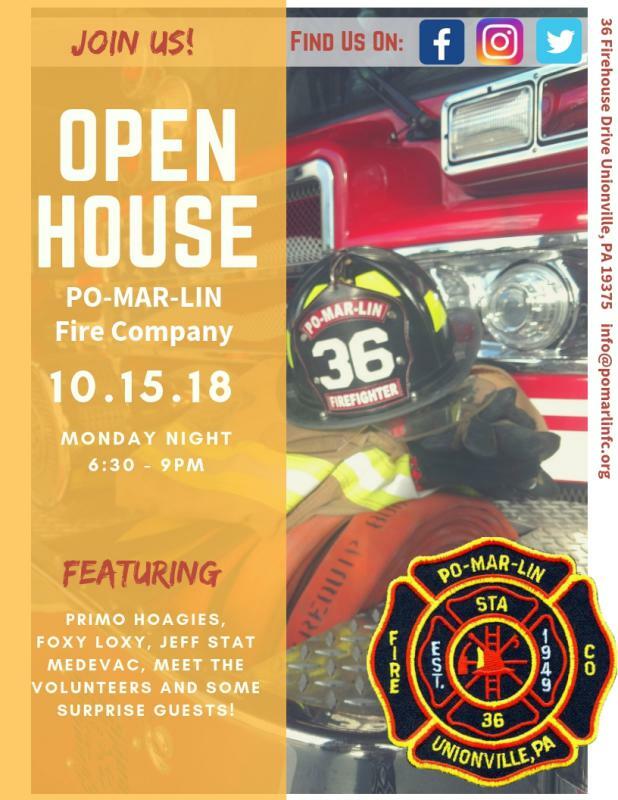 Join us on Monday, October 15, 2018, from 6:30pm-9pm to celebrate Fire Prevention Month with our Community Open House. All are welcome! Bring your friends and family to meet our volunteers and to learn more about how we strive to serve our community. Stop by to brush up on your fire prevention education, take a tour of our station, and try on our turnout gear. Our apparatus will be on display, including our new Large Animal Rescue Trailer, so come explore and ask questions- we can’t wait to show you around. We’ll also be featuring a live vehicle rescue demonstration to showcase our training efforts and the power of hydraulic rescue tools. JeffSTAT MedEvac Helicopter, a medical transportation service owned and operated by Thomas Jefferson University Hospital, is expected to land around 7:00pm and will be on display as well. Food will be available for purchase from Primo Hoagies and Foxy Loxy will provide free ice cream. There may be a few surprise guests... so you won’t want to miss out!